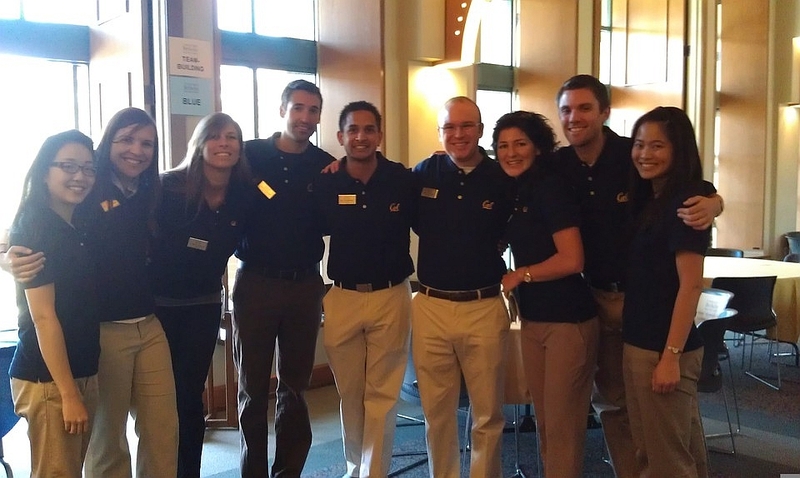 Full-time students share their experiences in the Berkeley-Haas MBA program. The magic of Days at Haas!!! Although the weather was less than perfect, the entire Haas community was excited to show our admitted class of 2014 what makes Haas unique. More than words on a page, we believe and act according to our four defining principles. They were present in each and every interaction that weekend. These principles are, in our opinion, what makes Haas unique. One of our goals was to show the class of 2014 how integrated the principles are in our daily lives. With more than 150 attendees (partners included, as always) and more than 100 current students volunteering, the weekend was a blast. We hope every attendee had fun, learned about the classroom experience, connected with alumni, professors, and clubs about career opportunities and most importantly got to know awesome new classmates. We were very impressed by next year’s class! them. We planned the Amazing Race teams, discussed seating assignments for dinner at the Faculty Club, and organized homes for student dinners! We got to know students’ preferences, career goals and even dietary restrictions! We couldn’t wait for the opportunity to put faces to names. By our first interactions, the dinner, and Bar of the Week, it was quickly apparent that the class of 2014 has amazing energy, broad and inspiring experiences and a huge desire to be agents of change. We saw bonds already being formed, future companies being discussed, and heard great real-time feedback about the weekend’s events! While we had naturally hoped that Days at Haas would be a great experience for incoming students, the weekend was a truly eye-opening experience for the HSA team as well! We realized quickly that we’d be honored to be your classmates. The admitted students reminded us of why we chose to come to Haas. We recalled our passions, our career goals and our enthusiasm. We are now preparing for Days at Haas 2 and we are certain that it will be just as amazing as the first edition, so come with energy and curiosity! Early last year, in the midst of my business school application process, I was invited to attend Haas’s Super Saturday, an on-campus, Admissions-led event consisting of lunch, student life and career panels, a campus tour and, most importantly, my Haas interview. Thanks to my stubborn unwillingness to take anything but public transportation and a total unfamiliarity with the Berkeley bus system, I remember arriving at Haas sweaty, semi-lost, and out-of-breath after hauling it through the greater Berkeley campus on an impossibly gorgeous February day. Way to make a good impression, right?